The University of Rochester offers two Health Care Plans: the YOUR HSA-Eligible Plan and the YOUR PPO Plan. Explore the resources below to ensure you choose the plan that is most cost effective and appropriate for you and your family. Deductible only applies to inpatient, outpatient, emergency room and urgent care services. Deductible applies to all medical and pharmacy services except for preventive care services. Preventive care services are covered at 100% for Tier 1 and Tier 2 providers. Deductible does not apply. After meeting out-of-pocket maximum, plan covers services at 100%. You pay your share of the copay or coinsurance until you reach the out-of-pocket maximum. After meeting the deductible, you pay your share of the copay or coinsurance until you reach the out-of-pocket maximum. You will have the option to contribute to a Flexible Spending Account (FSA). You will have the option to contribute to a Health Saving Account (HSA), Limited Purpose FSA, or Health Care FSA. 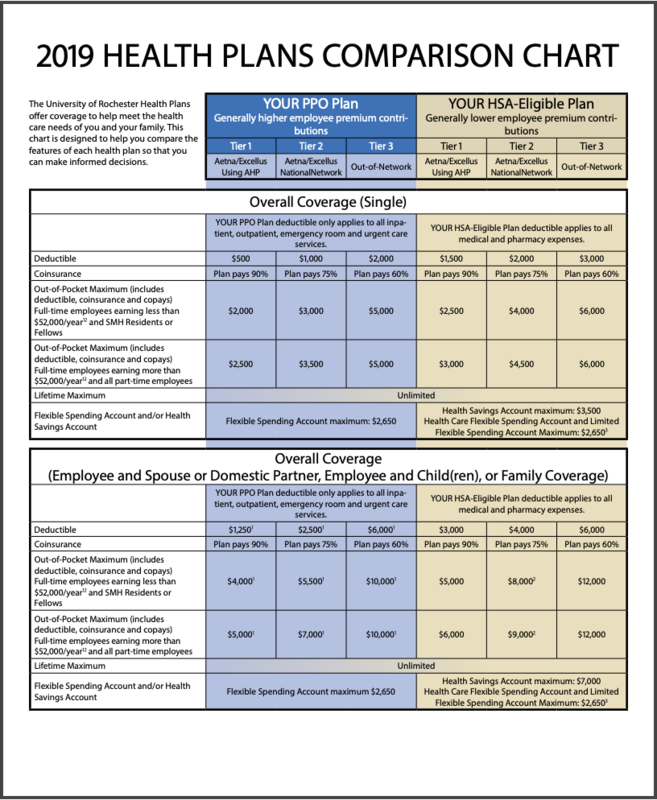 Need help choosing a health plan? Use the ALEX tool, an online benefits decision tool that will assist you in understanding your benefit options and enable you to make an informed decision when making your benefit elections. If you enroll in coverage under the University Health Care Plans, you will need to choose which TPA will administer your Plan- either Aetna or Excellus BlueCross BlueShield. Since each TPA has contracted with in-network providers to offer health care services at negotiated fees, it is important to consider the TPA network availability when choosing your TPA. Explore the Aetna Directory of Healthcare Professionals and the Excellus Doctor Search tools to see if your providers and facilities are members of either networks. If you enroll in one of the University of Rochester Health Care Plans, you will automatically receive prescription drug benefits in conjunction with your plan. Your TPA will provide your prescription drug coverage. The Aetna drug formulary and Excellus BlueCross Blue Shield drug formulary are used to determine the level of copay(s) or coinsurance you will be responsible for depending on the medication prescribed. The UR Employee Pharmacy offers a discount to all employees and their eligible dependents enrolled in a University of Rochester Health Care Plan. The pharmacy is located in the Medical Center, though they do offer courier services for employees located in off-site locations. Visit the UR Employee Pharmacy website for additional information. Accountable Health Partners (AHP) is a clinically integrated network of hospitals and physicians with a proven record of improving quality outcomes and delivering value. Both Aetna and Excellus BlueCross BlueShield give you access to AHP providers. When visiting an AHP provider, also referred to as a Tier 1 provider, you will have a lower deductible, copay, and out-of-pocket maximum than Tier 2 or Tier 3 providers. To find Accountable Health Partners providers in your area, visit the AHP Provider Search website. While you receive the highest level of benefits when you visit AHP providers, you can receive care through a combination of AHP, Tier 2 and Tier 3 providers. You do not need to choose a tier when enrolling, your level of savings will vary as you visit providers in different tiers throughout the Plan year. The deductible and out-of-pocket maximums cross apply for all three tiers. To find providers in the Aetna National Network, use their DocFind tool. To find providers in the Excellus National Network, use their Doctor Search tool. When prompted to “Choose Your Network”, select “BlueCard PPO/EPO”. Both Aetna and Excellus also offer cost estimator tools to assist with plan selection process. Aetna Plan Selection and Cost Estimator Tools: Log in to Aetna Navigator and select “Cost of Care” on the navigation bar. Then, select a condition to see both in-network and out-of-network costs specific to your area. Excellus Treatment Cost Advisor and Provider Selection Advisor Tools: Log in to Excellus BCBS and select “Excellus BCBS administers my UR Health Care Plan”. Are not covered by or eligible for health insurance coverage through another employer’s group health plan (e.g. their own employer’s plan, or the plan of their other parent’s employer). During the University’s annual open enrollment period. If you or a covered dependent lose coverage through the University Health and/or Dental Plans, COBRA coverage may be available. View the COBRA Notice for additional information.